CRUCIAL INTERIOR WALL CRUMBLES AND COLLAPSES IN MUSLIM TEMPLE AREA IN JERUSALEM WHY ARE AMERICAN AND ISRAELI MASS MEDIA NOT REPORTING THIS MAJOR EVENT? Title: CRUCIAL INTERIOR WALL CRUMBLES AND COLLAPSES IN JERUSALEM MUSLIM TEMPLE AREA -- WHY ARE AMERICAN AND ISRAELI MASS MEDIA NOT REPORTING THIS MAJOR EVENT? Subtitle: Three years ago Cutting Edge reported that Arafat was planning to blow up or otherwise destroy his own holy places in order to blame Israel and start the "Cup of Trembling" against Israel as foretold in Zechariah 12! Now, is the stage set for this destruction? 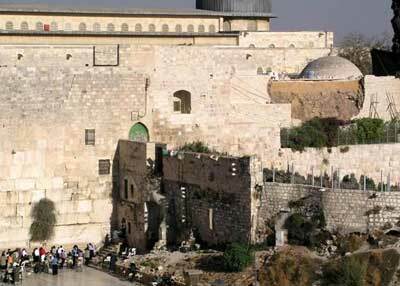 NEWS BRIEF: "Interior wall collapses at Jerusalem site holy to Muslims and Jews", krnv.com, Reno, Nevada, September 24, 2003, Channel 4 News. "Jerusalem-AP -- Israelis and Palestinians are blaming each other for the collapse of an interior wall at Jerusalem's most hotly disputed holy site. The wall is near the Islamic Museum on the hilltop where the Al Aqsa Mosque sits atop the ruins of the biblical Jewish Temples ... The site is so holy to both Jews and Muslims that any major damage could trigger a religious war." This last sentence captures the reality facing the region today. Three years ago, we wrote an article in which we stated our belief that Arafat and his Palestinian Authority were planning to blow up or otherwise destroy their own holy places [NEWS1404] in order to trigger a global outrage against Israel and cause all the world's 1.4 billion Muslims to come against Jerusalem in wave after wave until the Jews are annihilated and purged, thus making "Palestine" free of the Jewish "taint" and pure so the Muslims can live there. When the holy places in Jerusalem are destroyed and Israel is blamed, the prophecy of Zechariah 12 will most likely be fulfilled. Certainly, when the Muslim holy places are destroyed, Jerusalem shall become a "Cup of Trembling" to all the Muslims "round-about"; in fact, all Muslims throughout the world will go into their infamous "day of rage", a "day" that will not end for them until the Infidel Jews are destroyed and the land "cleansed" of their presence! With furious anger, Muslims will fling themselves and all the arms they possess against Israel. Repeatedly, Arafat has promised that millions of Muslims will have the opportunity to "march on Jerusalem". 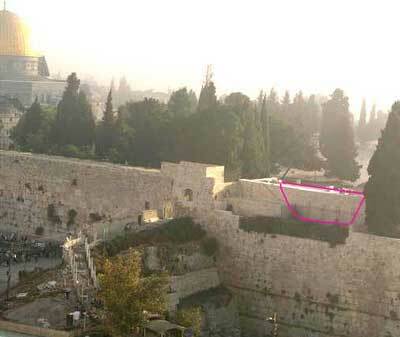 Now, let us go to another source to see exactly how important this collapsed wall is to the rest of the Muslim buildings on the Temple Mount area. 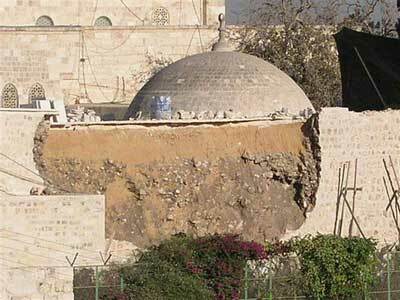 NEWS BRIEF: "Structural collapse on Temple Mount: Muslims blame Israel for failure of interior wall in Al-Aqsa Mosque", WorldNetDaily, September 25, 2003. "An interior wall has collapsed at a hotly contested Jerusalem holy site, setting off fears of religious violence between Muslims and Jews ... The collapsed wall is situated near the Islamic Museum ... 'It looks terrible,' said Eliat Mazar, an Israeli archaeologist and Temple Mount expert and a leader of the committee for preventing the destruction of antiquities at the site. 'This collapse might cause a terrific series of collapses'." 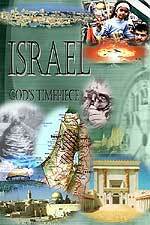 NEWS BRIEF: "Temple Mount Wall Collapses", IsraelNationalNews.com, 25 September 2003. "Archaeologist Dr. Eilat Mazar, a member of the Committee to Prevent the Destruction of Temple Mount Antiquities, said that the collapse is connected with the illegal construction works being carried out on the Temple Mount by the Moslem Waqf ... 'No one is concerned about preserving the ancient compound,' she said, 'nor has anyone mapped, surveyed or buttressed the hollow areas under the Temple Mount and under the mosques... It is frightening to think of this collapse, and of what could happen in the future when many tens of thousands of people visit the Temple Mount, and tractors and trucks - and all of this atop hollow areas that have never been professionally checked. This collapse should be a warning bell. 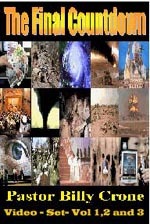 If a catastrophe occurs, the whole world will blame Israel." This article is quite remarkable for the insights it offers. "It is frightening to think of this collapse, and of what could happen in the future when many tens of thousands of people visit the Temple Mount, and tractors and trucks - and all of this atop hollow areas..."
Let us quantify this revelation. Our search on the Goggle Search engine discovered that on Friday, January 15, 2000, 450,000 Muslim worshippers crammed into the Temple Mount for Daily Prayers ["Monica's Dispatch", http://www.worldtrek.org/odyssey/mideast/011500/011500mondome.html]!! If you assume that the average Muslim worshipper weighs 135 pounds, the total combined weight of 450,000 worshippers is 60,750,000 pounds, or 30,375 tons!! Then, if you had dump trucks and digging tractors up on the Dome of the Rock compound, you may have up to 40,000 tons of weight sitting upon an area that now has "hollow areas" honeycombed throughout the complex! If this structure comes crashing down under this type of scenario, many thousands of devout Muslim worshippers could die and many more thousands injured. This type of disaster would infuriate Muslims against the Jew more than Pearl Harbor infuriated Americans against the Japanese, more than the Gulf of Tonkin infuriated Americans against the North Vietnamese, and more than 9/11 infuriated Americans against Osama bin Laden and his dastardly band. Did you get that? The Plan to produce Antichrist [New David] envisions that, by the time he appears east of Jerusalem riding on a donkey just as Jesus did on what we today celebrate as Palm Sunday, he will encounter the "rubble of the Dome of the Rock"! In NEWS1643, we reveal that the hidden agenda of global Freemasonry is to seize control of the Temple Mount from both the Jew and the Muslim so they can rebuild Solomon's Temple! Of course, this newly constructed Temple would really be built for Antichrist, the Masonic Christ who is planned! The world seems uniquely ready for the planned World War III that will produce to start. By collapsing the Dome of the Rock, the Illuminati gets a "two for one" payback; they will be able to seize control of the Temple Mount from those pesky Arabs while they are able to stage their Christ through the world war that will be triggered by this collapse. WHY IS THIS NEWS NOT BEING REPORTED? Late yesterday afternoon, I got the first alert from a subscriber that this wall had collapsed. He sent me two articles: one was from an Arab source and one was from an the website of an American TV station, Channel 4 in Reno, Nevada. I expected that, when I logged on to the Internet to begin my Daily News Updates this morning (9/25/03), I would see many articles in the press around the world about this wall collapse. I especially expected The Jerusalem Post and Ha'aretz News to fully cover this collapse. Imagine my surprise when these establishment news outlets did not cover this story at all!! Furthermore, American news outlets were not reporting this story except for WorldNetDaily. All day long, I kept checking to see if these Mass Media outlets were reporting this wall collapse, as it certainly had the potential to start a world war. As of the time of this posting, no major American or Israeli news source had reported this story. Then, a thought hit me like a ton of bricks. The Israel government should be acting responsibly to cordon off the entire Temple Mount, to keep tomorrow's Muslim worshippers off the mount. They should be posting all kinds of warnings to the Muslims to this effect. Yet, we can find no evidence that the Jewish authorities are taking this quite logical action. If the Jews were really worried about a collapse starting all-out war, this kind of action is both logical and urgent. Yet, in the same type of mysterious manner in which the Israeli governments of Barak and Sharon refused to stop Arafat from digging recklessly under the Temple Mount for the past three years, today we can find no evidence that Sharon is going to stop the Muslim worshippers off that Temple Mount. We can only wait and fear to see what will actually develop. Is September 29 beckoning [Read NEWS1849]? Remember, we are not predicting anything, but the scenario does seem primed to explode.